In Valmiki’s immortal creation, the Ramayana, Rama arrived at the seashore of Rameswaram trying to find a way to cross the sea to reach Lanka where Sita was being held by Ravana. It was Hanuman who had come here first on his search for Sita. He being the son of Vayu, the Wind God, had just taken giant leap across the sea. Rama had to find a way to cross the sea safely with his army of Vanars. Rameswaram is where Rama decided to build the sea bridge and that is why one of the names of the island is Setu, the Bridge. It is also the place where Ravana’s brother Vibhishana left Lanka and joined Rama in his battle of righteousness. Rama held Vibhishana’s coronation here and crowned him as the king of Lanka. It was not going to be easy to build a sea across a turbulent sea. Rama first worshipped Varuna, the god of the oceans, praying that the waters would move away but his prayers were not answered. Then an angry Rama picked up his bow and aimed an arrow at the sea, threatening to dry up all the waters. At this Varuna rose from the depths and explained his problem. The nature of an ocean is to flow and so he could not move away but he had a suggestion for Rama. The Vanar army should build a bridge using stones and trees and the ocean would support it. The architect of the bridge was Nala, the son of the celestial architect Vishwakarma. The Vanars carried in boulders and tree trunks and as he had promised, Varuna made the bridge float on his waters. This was the Ramasetu and it was so well constructed that poets describe it as looking like a beautiful parting in the hair of the ocean. There are huge rocks that are visible in the bay between Rameswaram and Sri Lanka that are said to be the remains of the Ramasetu. Ravana was a very powerful king and a mighty warrior and Rama and Laxman knew it was going to be a very tough battle. They would need divine help to succeed. So before leaving, Rama worshipped the gods and goddesses, praying for victory. He prayed to Shiva, Vishnu, the warrior goddess Durga and the nine planets. All the deities promised him victory and gave him their celestial weapons and Vishnu and Durga stood guard at the bridge during the battle. Today temples stand at all the places where he performed these yagyas at Rameswaram, Devipattinam and Tirupullani. The most sacred is the Ramanathaswamy Temple at Rameswaram that has a jyotirlingam of Shiva. After a mighty battle Rama triumphed, killing Ravana, his brother Kumbhkarana and son Indrajit. Then riding the celestial chariot, the pushpak ratha he came back to Rameswaram with Sita. Here he decided to perform an antyeshti yagya, or the funeral rites for Ravana. He also did a prayaschitta yagya, a religious rite of atonement because he had killed Ravana who was a Brahmin. With this yagya he hoped to appease Shiva as Ravana was a great devotee of Shiva and the god was displeased at his death. Today the great Ramanathaswamy Temple stands at the place where this yagyas took place. So at Rameswaram, Rama an avatar of Vishnu worships Shiva who is addressed as Ramanathaswamy, the lord of Rama. The shivalingam in the Ramanathaswamy Temple is considered to be one of the twelve sacred jyotirlingams. Also the tirtha is important for funeral rites and pind daan, the worship of ancestors, because of the yagya by Rama. 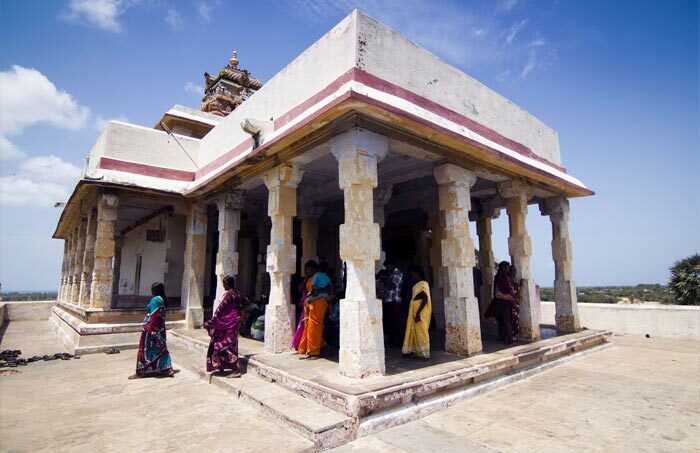 For centuries Rameswaram has been connected to the great Shaiva tirtha of Varanasi and often pilgrims visit both the places where temple rituals include Rama’s name. They carry the water of the Ganga to Rameswaram and of the ocean to the Kashi Vishwanath Temple to consecrate the shivalingams.